If you're like me, you spend a large part of your weekdays at a desk, in front of a computer. Time for exercise has to be found in the early mornings and the evenings, after work and parenting and all of the other things that you need and want to do. Or does it? The handy little devices made by Fitbit prove, once and for all, that fitness comes not only from the big workouts and sweaty hours spent in the gym but also from the small choices that add up to meaningful differences: the extra steps taken to walk to a meeting instead of ride the subway or take a taxi, the escalator ignored in favor of the stairs, and the extra hour of sleep chosen over one more TV show or one more chapter of your book. Fitbit offers a number of different activity trackers, all of which begin with the concept of the old-fashioned pedometer and then expand to offer a range of ways to monitor your level of movement, intake of food, and hours and quality of sleep. 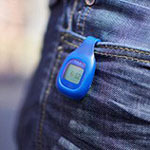 Some of the trackers clip to a belt or bra strap (and also work around the clock for you), while others are discrete bracelets that flash different colors to nudge you to get out of your chair and go for a walk. All of them easily sync with smart phones or computers to provide longitudinal data, and all of them challenge us to move a little more, sleep a little longer, and eat a little healthier. If you could benefit from a virtual coach who comes everywhere with you, emails you encouraging messages, and only wants you to get fitter, check out the Fitbit trackers!